Multiscale analysis of tendons from adult Egr1–/– mice. (A and B) Macroscopic views showing tail tendons of mouse tails close to the body from 2-month-old WT (A) and Egr1–/– (B) mice. (C) Number of tail tendons counted at the same level (close to the body) from 2- to 3-month-old WT and Egr1–/– mutant mice. 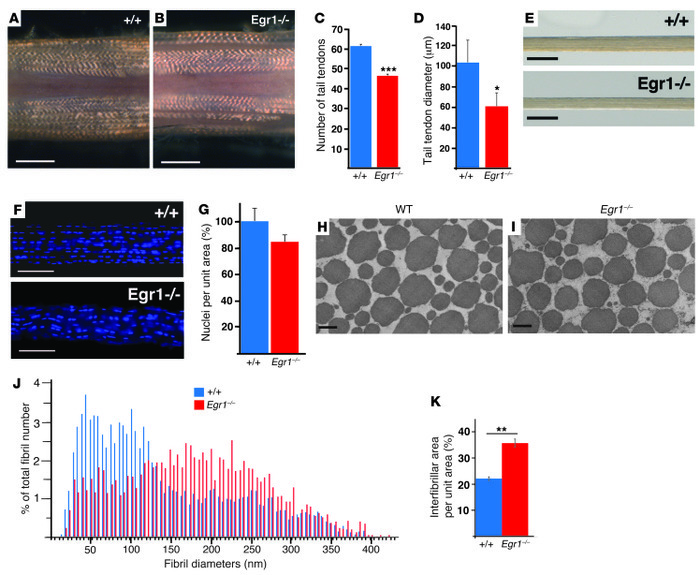 (D) Tail tendon diameters from 2- to 3-month-old WT and Egr1–/– mice. (E) Examples of isolated tail tendons from WT and Egr1–/– mice. (F) Hoechst staining of individual tail tendons from WT and Egr1–/– mice. (G) Number of nuclei per unit area in tail tendon sections from 2- to 3-month-old age-matched WT and Egr1–/– mice. Numbers of nuclei were normalized to those in WT mice. (H and I) Electron microscopic analysis of tail tendons from 2-month-old WT and Egr1–/– mice. (J) Histograms showing the frequencies of fibril diameters from WT versus Egr1–/– mice. For WT mice, the mean of the diameters = 143.89 nm; SD = 87.63. For Egr1–/–, the mean of the diameters = 183.73 nm; SD = 84.88. (K) Interfibrillar area (per unit area) of tail tendons from WT and Egr1–/– mice. The error bars represent the SEM. *P < 0.05; **P < 0.01; ***P < 0.001. Scale bars: 1 mm (A and B); 100 μm (E and F); 200 nm (H and I).